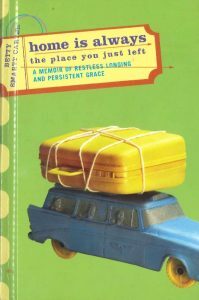 Betty Smartt Carter, essayist and novelist, relates her student years at Wheaton College in her poignant, brutally honest memoir, Home is Always the Place You Just Left (2003). My love for Wheaton is now so great that it’s hard to remember why I disliked it when I first went. But I did. What caused me to choose such a vibrantly Christian college in the first place, I cannot tell, except that my brother Danny had gone there in the early 1970s and had come back making it sound like heaven on earth. Maybe I thought I’d follow a similar path. I’d leave home a lonely and confused teenager and come back a happy, well-rounded adult. As for my Christianity, I’d continue the part of the small-time rebel and cynic, only without having to deceive anyone about it. Driving north from Georgia with her family, Betty warily embraced the next chapter of her life. In the fall of 1983, I took my cynical self north to Wheaton College, the very flower of evangelical Christianity. The school had a fine academic reputation, but it was best known for turning out missionaries, evangelists and martyrs, not to mention the odd Republican politician….it allowed no drinking or smoking or dancing (except chaste square-dancing such as had been practiced across the northern Illinois prairie for nigh on one hundred and fifty years); it encouraged Christian dating and marriage but prohibited all forms of hanky-panky. The unofficial motto of the school was “in loco parentis,” which meant that I wasn’t supposed to do anything there to bring shame upon my Mama and Daddy, and if I did, I’d be sent home on the next bus out of Chicago. Betty was off to a rocky start, struggling with a few personal issues. Touring the campus with her parents, she entered freshman orientation with a decided sense of dis-orientation. I felt myself slipping into something like shock. Why had I decided to leave behind my home, my family, and above all my beloved friend in order to come to this place that seem like nothing so much as a great big youth group meeting, a church service that would on on for four years? However, as she developed friendships, along with widening intellectual and spiritual perspectives, she found a surer voice and steadier feet. Then one day after reading [Augustine’s] Confessions, I sat in chapel and had a sort of epiphany. I looked out to my left and right, in front of me and behind me, over those thousands of serious young faces, and I realized that behind so many of the faces must be minds and hearts, like mine, in turmoil. I’d thought Wheaton evangelicals as hypocrites because they seemed so falsely positioned. But they were being deceitful only in their behavior — not in their hopes, which were real. They honestly did want to be passionate about God. They wanted to be the strong, faithful people that they appeared to be when they prayed aloud at dorm meetings, when they sang, “They joy of the Lord is my strength!”…Instead of resenting them, I felt compassion for them. It was as if a great backdrop had fallen away at the front of the chapel and I saw the inner workings of the place: people worshiping, doubting, praying, turning in all directions, longing for God but unable to wait for God….I left chapel feeling a burden lifted off of me: I didn’t have to agree with these people, or accept all their thinking, in order to sympathize. I could laugh at them for the excesses and love them for their hopes. Betty Smartt Carter has also published I Read It in the Wordless Book and a mystery novel, The Tower, the Mask and the Grave. Her writing has appeared in Books & Culture and several other journals. Standing before her classroom of Wheaton College students, Dr. E. Beatrice Batson was known to recite the exquisite verse of Donne, Herbert, Crashaw, Homer, Dante and particularly Shakespeare. A gracious Southern lady, she exhibited both an unaffected dignity and an unassuming humility. During the years of her retirement, Dr. Batson would reflect on her nine decades of life, her reading and travel, and tell her own stories rather than those of her beloved poets. I visited Dr. Bea every other week or so at her retirement home and she shared a few with me. Seated in her recliner while sometimes breathing with difficulty into a respirator, a red blanket tucked beneath her chin for warmth, she retrieved the chapters of her full life from shelves laden with memory. She remembered when Dr. V. Raymond Edman, fourth President of Wheaton College, occasionally tasked her with editing his devotional books. She would delicately dodge the gig whenever possible to avoid hurting his feelings because she did not like his flowery, mystical style of writing. On another occasion, when I asked her for a character reference for my registration as an online student at Bob Jones University, Dr. Bea confided that she, too, had attended Bob Jones College, then located in Cleveland, Tennessee, way back in 1938. For how long? “For ten days,” she replied in her deliciously cool, dry drawl. She remembered attending a production of Shakespeare’s Richard III, in which the founder’s talented son impressively portrayed the murderous hunchbacked monarch, though for that performance he had forgotten to limp. “Aside from that,” she added, “he sure was good looking.” When she broke the news to Dr. Bob, Sr. that his college was not for her, he objected. “Bea,” he said, “that just don’t make sense. And if it don’t make sense, God must not be in it.” But it made sense. She moved from there to George Peabody College, then Vanderbilt University and Bryan College. God was in it. Teaching English at Bryan College from 1947-57, she remarked that she “loved that little school,” but endured a few administrative challenges posed by its president, Dr. Theodore Mercer. She was reticent to comment on those years. When opportunity knocked, she departed Bryan College with the highest recommendations, heading north to Wheaton, Illinois. On another visit she recalled a 1970’s trip to England with Dr. Clyde Kilby, Chair of the English Department at Wheaton College and founder of the Marion E. Wade Center. Dr. Kilby handed her a meatloaf as a gift for the aging widow of Charles Williams, an Inkling along with J.R.R. Tolkien and C.S. Lewis. Evidently, the characteristically austere Mrs. Williams was “quite pleased” to receive the dish. Why? Dr. Bea shrugged, observing in her drollest intonation, “For pity’s sake, I cannot fathom why a meatloaf would arouse such excitement.” The details behind the meatloaf caper remain a bit sketchy. In the following months it became increasingly apparent that the vivid colors of her memory were fading. Her focus was loosening. Books stacked on her bedside table, much-loved titles by Dorothy L. Sayers, Walker Percy and P.D. James, remained untouched. One day she matter-of-factly announced that her manuscript on John Bunyan had been accepted by a major university press who would soon publish it with minimal editing. Congratulations! But I knew that her Bunyan book had been published in 1984. On the afternoon of my final visit she was awake, though faint and sleepy, lying motionless in her recliner beneath the blanket. After briefly chatting, I held her hand, then stood in the doorway. “Goodbye, honey,” she said, her voice brittle with age and illness. “I love you.” I love you too, Miss Bea. Three days later, like the hero of The Pilgrim’s Progress, she entered the Celestial City. The red blanket is cast aside. The respirator is unplugged. Beatrice Batson soars and sings in Henry Vaughan’s “great ring of pure and endless light, all calm as it [is] bright,” joining C.S. Lewis, V. Raymond Edman, Clyde and Martha Kilby, Dorothy L. Sayers, Bob Jones, Madeleine L’Engle, George MacDonald, Theodore Mercer, Shakespeare and all the adoring multitude of students, family and friends who’ve preceded her through the golden gate. Professor Batson (1920-2019), Professor Emerita of English at Wheaton College, served as Chair of the Department of English for thirteen years and taught courses in Shakespeare for thirty-three years. 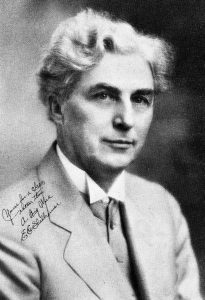 Professor Batson was the author or editor of 14 books, and the author of numerous chapters in compiled works. During her teaching career, she was a frequent lecturer on college and university campuses in the United States and Canada. After her retirement Professor Batson became the coordinator of the Batson Shakespeare Collection in Special Collections, Buswell Library. She developed the collection into a unique resource bringing together the best scholarship on Shakespeare and the Christian tradition. The Reverend Jim Jones, ordained by the Independent Assemblies of God and the Disciples of Christ, founded the Peoples Temple as a haven for the poor, the lonely and the forsaken. Unlike too many churches of the 1950s, the Temple was integrated and radically multi-ethnic. Fearing nuclear strikes during the Cold War in the vulnerable Midwest, Jones and his loyal congregants moved from Indianapolis to California, eventually settling in San Francisco, concentrating on aiding the oppressed and impoverished. Timothy Stoen, a graduate of Wheaton College and Stanford Law School, met Reverend Jones in 1968 while employed as a deputy district attorney in San Francisco. Timothy Stoen, 1960 Wheaton College yearbook. Angry over racism and social disparity, Stoen was impressed with the large numbers of African Americans attending Jones’ church. He told an interviewer, “I had never seen such love between black people and white people — white people actually going up and physically hugging and touching black people and making them feel at home. I remember having seen Jim Jones go up to a little old black lady and just saying, ‘I love you, darling,’ and her eyes just shone.” Joining the People’s Temple, Stoen defended it against attack and offered free legal advice. Reverend Jones, awash in bitter allegations and spiraling paranoia, relocated his congregation to the humid jungles of Guyana, establishing the People’s Temple Agricultural Project, also called Jonestown, where Stoen sent his six-year-old son, John Victor, to be communally raised. In 1977 Stoen resigned his job with the district attorney and moved to Jonestown to join John Victor. After Stoen returned to California for a short period, his ex-wife, the former head counselor for the People’s Temple, revealed to him that Jones’ “miraculous” healings were fake. Pressure on the Temple increased as news agencies reported financial fraud and human rights abuses. Daily the tropical socialist utopia crumbled beneath Jones’ mental instability. Awakened to the mounting danger, Stoen fought to retrieve his son, but Jones refused. Members promised they would die before surrendering John Victor to Tim Stoen or the U.S. government. On November 18, 1978, Jones, desperate and totally unhinged, ordered his followers to drink grape Flavor Aid (not Kool-aid) laced with potassium cyanide. Sadly, they obeyed. As hundreds of men, women and children dropped choking and vomiting to the ground, Jones, speaking calmly through a loudspeaker, exhorted his surviving disciples in San Francisco to “get” Tim Stoen. Continuing his rant, Jones ominously prophesied that the young attorney with “nobody else to hate” would finally destroy himself. By the end of the day, 907 people lay dead, including 304 children. John Victor was found poisoned in Jones’ cabin, and Jim Jones lay dead from a gunshot wound to the back of the head, delivered by an unknown assailant. Jonestown remains the largest mass murder in history. Historians note with irony that were it not for this event, Reverend Jim Jones would be remembered as a great civil rights leader. But I also had deep guilt for violating the “moral code” — for sinning against God. Guilt for replacing the whole truth of God with the half truth — the idolatry — of ideology. Guilt for violating fidelity in marriage. Guilt for giving Jim Jones credibility while blinding myself by ideological passion to his emerging flaws. Guilt for making numerous untrue statements, and committing other moral compromises along the way. As Stoen struggled with his haunted memories, it seemed that Jim Jones’ prophesy was proving true. Reading several key books, particularly M. Scott Peck’s People of the Lie, Stoen began to somewhat comprehend the evil of Jim Jones and the psychological dynamics of the cult. He writes in his journal, “…This reading is making me see that I have a deep-seated passion for communion with God.” After hearing Alan Jones preach at Grace Cathedral in San Francisco, Stoen spent Good Friday, 1988, meditating on the stations of the cross. In response to that utterly poignant Good Friday, I recognized the truth that Jesus Christ had suffered and died for me, that he had then conquered death, and that he was now offering — to all who asked — forgiveness for the wrong things they had done. I asked Jesus the Christ for forgiveness. Miracle of miracles, I was given it. The grief was assuaged. The guilt was gone. Mercy had triumphed. The curse — Jones’ further trespass into Satan’s dominion — was smashed. The prophet was vanquished. On March 9, 1997, Timothy Stoen married Kersti (“Shesti”). On June 26, 2000, he resumed his career as a California prosecuting attorney. He was nominated in 2010 to the California District Attorneys Association as Prosecutor of the Year, and in 2014 was honored as one of the five top wildlife prosecutors in the state. 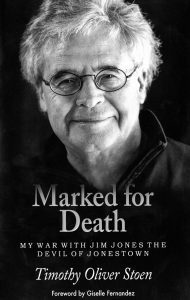 Stoen tells his remarkable story in Marked for Death: My War with Jim Jones the Devil of Jonestown (2015). 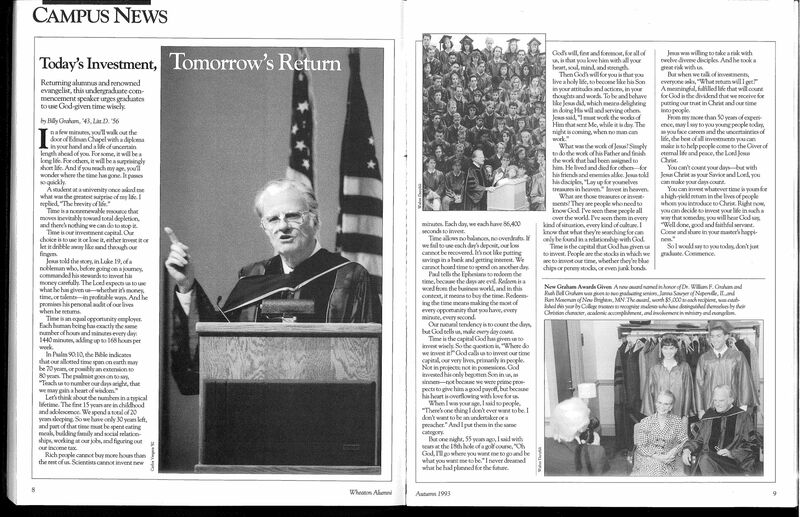 The following article was taken from the December 1981/January 1982 issue of the Wheaton Alumni Magazine. 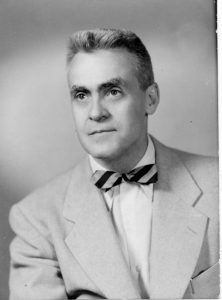 It celebrated the life and ministry of Evan Draper Welsh, Wheaton College chaplain, who passed away 37 years ago today. 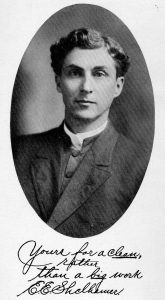 Evan Draper Welsh ’27, D.D. 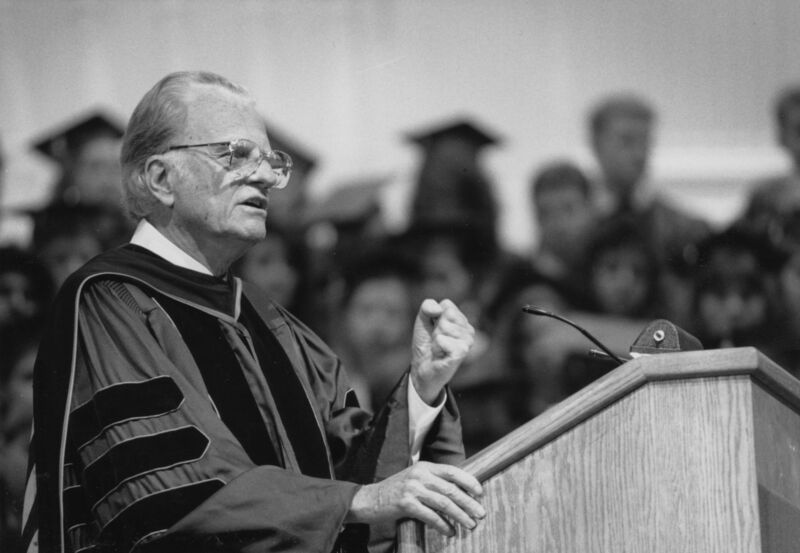 ’55, who served for 26 years as chaplain to Wheaton College students and alumni, died early on December 17, 1981. He suffered congestive heart failure in his home in Wheaton, and died shortly after entering Central DuPage Hospital. Born on September 3, 1904, in Princeton, Illinois, Evan spent his boyhood in Newton, Kansas, Long Beach, California, and Elgin, Illinois, before enrolling in Wheaton Academy. While attending Wheaton College, he served as president of his freshman class and as captain of the football team his senior year. Additionally, Evan’s activities at Wheaton included membership in the Excelsior Literary Society, the Y.M.C.A. Cabinet, and participation in varsity debate. Following graduation, he did graduate work at Princeton Theological Seminary and the University of Minnesota, where he studied English literature. While at Minnesota, Evan pastored Bethany Presbyterian Church on the college campus. In 1933, he accepted a call to pastor the College Church in Wheaton, where his father had served. During his 13 years there, he became very active on the Wheaton College campus. He also continued graduate study at Northwestern University, completing the M.A. in philosophy in 1938. Evan moved to Detroit in 1946 to pastor the 1700-member Ward Presbyterian Church. He also taught at Detroit Bible College. In 1955 Evan received an invitation from President V. Raymond Edman to accept the newly-created position of college chaplain on Wheaton’s campus. The new chaplain, who also served as assistant professor of Bible, was awarded the doctor of divinity degree from the College that same year. During his 15 years as chaplain, Evan became endeared to countless students through his helpful counsel, his faithful visits to the health center and local hospitals, and the traditional ‘open house’ hosted each weekend at his home. Evan retired from his post as chaplain in 1970, but continued in the capacity of alumni chaplain until his death. Even when on vacation he poured himself into building and renewing friendships with alumni, and encouraging them in their Christian faith. Evan’s outreach extended to the community through the teaching and visitation ministries of the College Church of Wheaton until his death. His popularity as a summer Bible conference speaker occupied much time in his earlier years. Evan’s commitment to spread the Gospel worldwide fired is involvement in the evangelism service and national and foreign missions of the United Presbyterian Church, U.S.A.
At the time of his death Evan was survived by his wife, Olena Mae Hendrickson ’41, of Wheaton, two daughters and eight grandchildren. He was preceded in death by his first wife, Evangeline Mortenson ’27. The relationships we value most become our greatest losses. In the homegoing of Dr. Evan Draper Welsh ’27, Wheaton College suffers the loss of an institution and countless thousands find a vacancy in their lives where a deep friendship had been. But the ministry of that life continues. From his perspective, Evan Welsh’s gift to us was only a means to an end. His love for us rose from a desire that we might know the love of a greater Friend, and commit ourselves to that One. Evan Welsh would not want praise lavished upon his life. The tributes given to him underline the purposes of his life. He related those goals in an article in The Tabernacle Bulletin, 1961. We pay tribute to a man who ran untiringly toward his goals. We thank a loving family who shared themselves and their dear one so freely. And we thank the Lord for His servant, Evan Draper Welsh, who reminded us of the beautiful reality of life in Christ. Walking with a cane, Muriel maneuvered efficiently throughout campus, carrying a tape recorder under her arm for recording lectures and class discussions. Listening intently to the sounds all around her, Muriel recognized fellow students and professors by their voices and footsteps, remembering names, though she hardly knew many of them. While enrolled at Wheaton College, she learned Braille and studied with friends as her vision worsened to total blindness, accompanied by terrible throbbing headaches. Navigating chapel aisles or crowded hallways, she was terrified that someone might jostle her and detonate the excruciating pain. 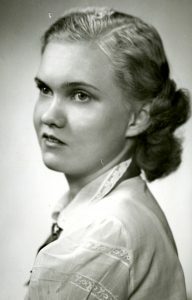 While attending the winter evangelistic services on February 7, 1957, the guest preacher, Reverend H. Lawrence Love, delivered the closing prayer as Muriel listened with her head bowed. Looking up, she was greeted by a stunning surprise. “There was my roommate,” she said, “plainly visible to me; the pain was entirely gone. How shocked I was! As soon as the service was over, I said to my roommate, ‘I can see! '” Later that night during a prayer meeting in Williston Hall, Muriel saw for the first time the girls who had been assisting her. The next day a medical examination proved 20-20 vision in her left eye. The Psychology Department chronicled the event as a genuine miracle. Students on the campus of Wheaton College during the 1940s had grown up in largely sheltered environments, free from bombings or foreign invasions, worshiping safely amid families and churches. It was surely enlightening, if not jarring, for these young men and women to interact with veterans like George W. Griebenow, who returned from WW II not only a decorated combat survivor but a key figure in apprehending a top ranking Nazi general. Seasoned at the age of 20, he had a few stories to tell. George W. Griebenow, looking somewhat uncomfortable in his 1943 college application photo. 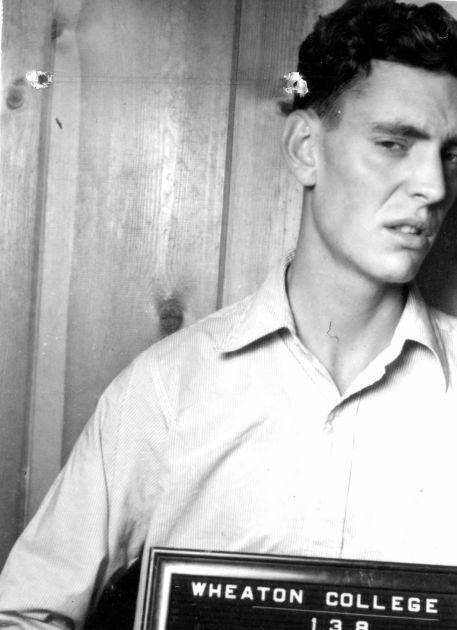 A freshman at Wheaton College when inducted into the Army on July 10, 1944, Griebenow returned to campus after the war to pursue ministerial studies. For a few months during his Wheaton College career, he dated Elizabeth Howard, later well-known author and wife of missionary Jim Elliot. Griebenow’s roommate was Ed McCully, who would later die with Jim and four comrades in Ecuador at the hands of the Waodani Indians. The notorious general stood six feet tall, sporting a network of scars across his face. Initially denying his identity to his captors, a search for official papers in drawers, mattresses and rafters clearly revealed his rank. Griebenow and his patrol with their prisoner re-traced the journey through the rugged countryside, risking potential ambush, to the U.S. camp station. “He was tough,” said Griebenow. 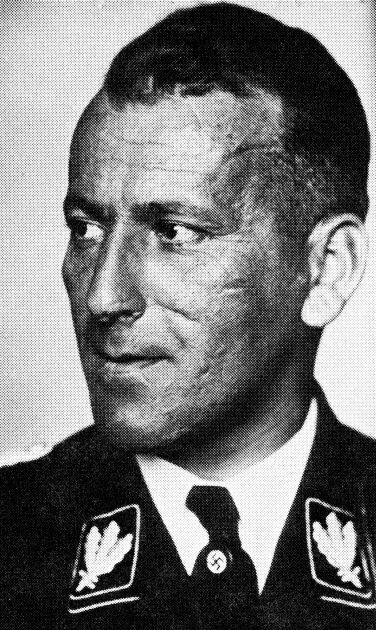 “He kept up with us.” Sent to Nuremburg for trial, General Ernst Kaltenbrunner was sentenced with other leading Nazis and hanged for war crimes and crimes against humanity on October 16, 1946. Sgt. Griebenow received the Army Commendation for the successful mission. He also received the Bronze Star for dragging a comrade out of enemy fire during the machine gun attack on Erfurt, Germany, and the Purple Heart for wounds received during the crossing of the Rhine at Frankfurt, March 28, 1945. George W. Griebenow, ordained in 1955, later served as district director of the Small Business Administration in Minneapolis. He died at age 60 in 1987. 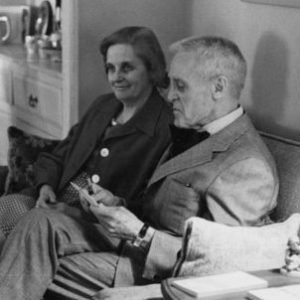 On this day in history (April 19), Wheaton alumna Ruth Margaret Mellis was born in 1907 in St. Louis, Missouri to Charles J. and Selina M. (Vollmer) Mellis. She attended Ritenour High School (Overland, MO) and graduated from Wheaton College in 1931 with a B.S. in Elementary Education. She was a member of the Philalethean Literary Society, and volunteered with the Y.M.C.A. In 1945 she left the city school system to volunteer to teach missionaries’ children in Africa as a non-professional at the Empress School in Ethiopia. During this 3 year short-term she assisted in the formation of the Wheaton Alumni Association of Ethiopia where many grads worked in that country. In August 1954 she sailed to Greece to be a teacher where she served alongside Worldwide Prayer and Missionary Union as an independent missionary ministering to grown orphans around Athens. In a 1967 prayer letter she began to direct funds to ELWA Greek programs with Sudan Interior Mission. The ELWA Ministries Association traces its roots back to 1952 when SIM (then known as the Sudan Interior Mission) joined with the West Africa Broadcasting Association that was attempting to start the first Christian radio station in Africa. Radio ELWA (Eternal Love Winning Africa), located in the Paynesville area east of central Monrovia, started to broadcast in January 1954. By 1973 she had moved to Puebla, Mexico with the Central Ameican Mission as a church planter among internationals. In 1977 she “retired” after 33 years of foreign service to St. Louis. For many years afterward she made many short-term trips to Mexico and Greece. She died on January 15, 2007 in Saint Ann, MO, three months prior to her 100th birthday. 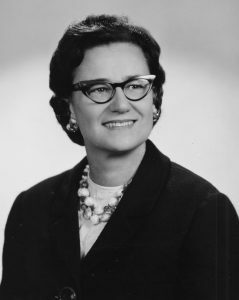 Her college memorabilia and scrapbooks are held in Special Collections and her personal papers are held in the Billy Graham Center Archives. The Evangel 4500, constructed by pilot-mechanic Carl Mortenson of Wycliffe Bible Translators, was the first twin-engine airplane specially designed for missionary use in the most remote, rugged areas of the world. Before Mortenson’s innovative engineering on the craft, small planes were limited to single-engine capability, susceptible to power failure during takeoff and landing on short jungle runways. 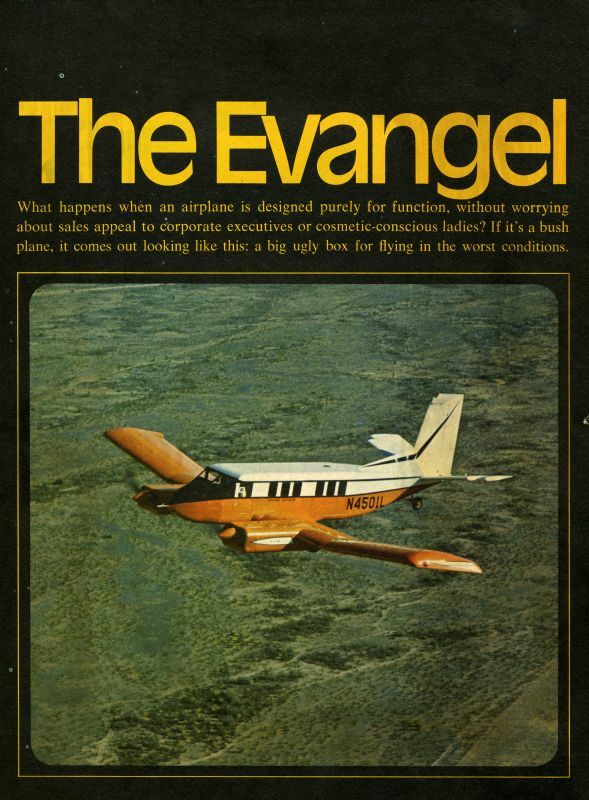 Receiving funding from several Chicago laymen, the Evangel 4500 was ready for its first major mission in 1969. Passengers for thetwo-month voyage to South America were pilot Mortenson, Dr. Paul Wright, chairman of the chemistry department at Wheaton College, and nine other board members of Project Evangel. Explaining the need for the plane, Wright remarked, “We don’t feel it’s right to expose missionaries to the hazards of a single engine plane. The Evangel 4500 can carry two passengers in addition to its 4 x 4 x 9 storage area, or the entire space can be used for passengers. It can take off with a full load in 498 feet. Its maximum altitude is 22,500 feet, but one with engine gone it can still fly at 7100 feet.” After the successful flight, Wright often lectured at local churches, telling the story of the unique airplane and its mission.